Almost halfway between Mexico City and the beautiful city of Morelia, a very special nature reserve has been established. 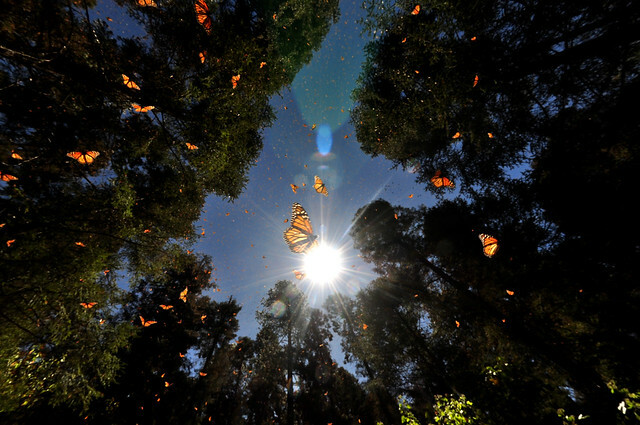 It is the Mariposa Monarca Reserva (Reserve of the Monarch Butterfly). Here every year, from the end of October to the beginning of November, millions of millions of butterflies arrive after an impressive journey of 4500 kilometers, started in Canada and in the Great Lakes region, in the north of the United States, making the Monarch butterflies the longest migration of insects in the world. In Mexico the winter months will pass and, after mating, the migration to the north will start again at the beginning of spring. Every year the same route is repeated and every year the appointment is renewed with beautiful colored swarms of big butterflies. Of course it will not be the same specimens that, going north, will reach the destination and then resume the road back the following year. No insect could ever live that long. How then can different individuals remember not only the journey, but even the same area, the same woods, where to spend the winter months? This is another amazing aspect of this incredible adventure. For five months the Mariposa Monarca Reserva turns into an enchanted forest where at dusk you can see fantastic colored compositions made up of tens of thousands of butterflies clinging in bunches on the branches of the trees. Although light like a breath of breeze, their number makes the branches sway, which sometimes even break under the weight of dense colonies of these beautiful butterflies. In the morning light the butterflies soar in the air, twirling in search of warmth and nourishment and resting on visitors. It is a show difficult to describe, of a unique charm. So special that it could not give rise to legends and myths. In fact, many natives believe that the souls of their dead return on the wings of butterflies, whose arrival coincides with the feast of the dead. Planning a trip to Mexico between November and March, do not miss this unique show. The Mariposa Monarca Reserva can be visited with excursions organized by Mexico City or Morelia, but this solution involves many hours of travel in the same day. If you want, you can stay overnight in one of the villages near the entrances of the reserve, even if with less comfort than in Morelia or Mexico City, from where you still have to arrive with hours of travel by bus. The most organized village is Rosario, though, as a result, it is the access to the area most frequented by tourists, who will then have to walk a long distance (2 to 4 km depending on the season) on a steep path to reach the fir woods, the habitat of butterflies. But their (and I hope your) effort will be amply rewarded by one of nature's most amazing shows.